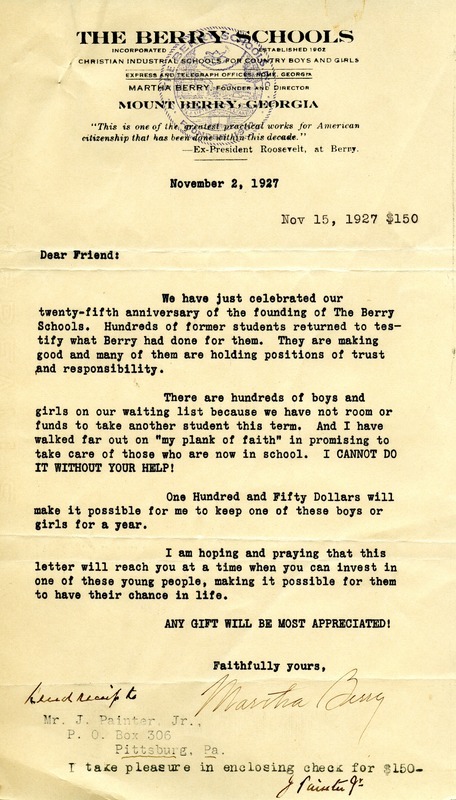 Martha Berry Digital Archive | Letter to Martha Berry from J. Painter Jr.
Letter to Martha Berry from J. Painter Jr.
Martha Berry writes that Berry has just celebrated twenty-five years, and about the need for funds to keep the boys and girls in school. The recipient has sent $150 in response to this appeal. J. Painter Jr., “Letter to Martha Berry from J. Painter Jr..” Martha Berry Digital Archive. Eds. Schlitz, Stephanie A., Chelsea Risley, Alan Henderson, et al. Mount Berry: Berry College, 2012. accessed April 23, 2019, https://mbda.berry.edu/items/show/5391.